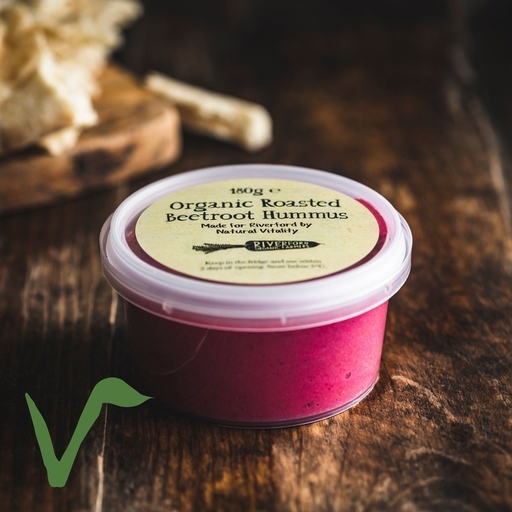 Our organic beets, slow-roasted until tender and blended with thick, rich hummus handmade the very same day. The earthy sweetness of the beetroot is a lovely complement to the nuttiness of the hummus, singing with aromatic garlic, sharp lemon, and the best extra virgin olive oil. Chickpeas (54.72%), filtered water*, beetroot (20%), extra virgin olive oil, lemon juice, tahini (sesame), garlic puree (garlic, citric acid*), salt*.